Energetic Lighting’s series of LED striplight fixtures are designed to emulate the look and feel of traditional 4-foot 32 watt fluorescent T8 tube striplights, but operate at a significantly lower wattage. 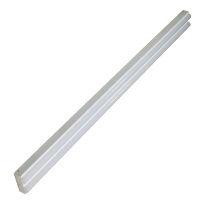 The single strip runs at an economical 20 watts, and is 2 feet. Designed for seamless surface mounting applications, with endcap knockouts that allow for end-to-end mounting and wiring. Combining a durable steel housing body and an LED lifetime rating of at least 50,000 hours, this rugged striplight is designed for many years of reliable operation.